Since the summer of 1970, 500 Germans have known that the banquet of the century awaits them, their hosts being the Junge Welt, a former socialist youth newspaper in the GDR. On the occasion of Lenin's 100th birthday, readers between 12 and 30 were asked to say how they imagined their everyday life would be in the year 2000. The motto was "Do you dare to dream?" 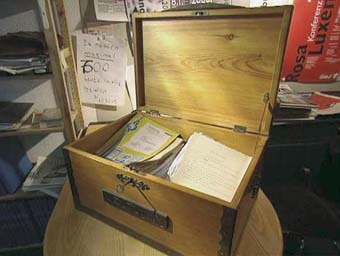 500 texts by the competition winners were bound in leather and kept in the newspaper's safe. On 8th January 2000, 30 years after the competition, the banquet actually took place. In their dreams, there were no more traffic junctions, holidays on Mars were a reality, trains moved on cushions of air, flying saucers hoved in front of the door, weather was arranged "centrally" in Moscow, and of course the class enemy has been long defeated. The reality now is rather different: Joachim G., for example, saw himself putting the Americans - the last representatives of imperialism - to flight, today he heads the computing department of a building concern. Heiderose B. wanted to do away with traffic junctions, but now she sells tea. The dreamers are now around fifty years old. The film takes the opportunity to compare five authentic aspirations for the future from the year 1970 with the reality of one of the first days of the new millennium. For the first time after thirty years, the winners were confronted with their work. Realising that the prospect of the future then was also a preview to half their lives is a deep shock. Thirty years are a long time. Holger Jancke was born in Berlin in 1966. In 1987, he began work as a researcher, assistant director, dramaturgist and author in the DEFA documentary film studio. Parallel to this, he made his own underground films and videos. Since 1990, he has written film reviews for the press, including for the taz and Berliner Zeitung. Also active as a writer, a selection of his films includes: Traeume und Traenen (2000), Das Bankett (2001), and Borderline (Grenze, 2004). Olaf Jacobs was born in Leipzig in 1972. After freelance work for youth radio DT64, he became an editor and presenter for MDR. He is also active on the business side of film-making and manages several media companies (Hoferichter & Jacobs, art & pictures, Cocopelli Music). His television projects have involved work for ARTE, MDR, ARD, SFB, and have included regular documentaries and educational features. The Banquet is first joint project with Holger Jancke.